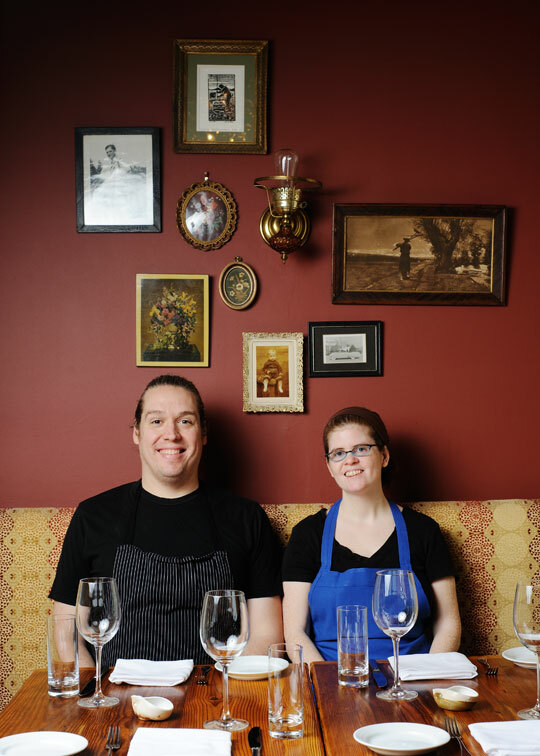 Andrew and Kristin Wood, chef-owners of RussetThis time of year, the word “russet” calls to mind potatoes and perhaps their dusty, tuberous and root vegetable brethren. Fortunately for Philadelphia locavores, Russet is also the name of the rustic, elegant Rittenhouse BYOB operated by chef-owners Andrew and Kristin Wood. At the height of summer, it may seem as though many chefs are devotees of farm-to-table cooking, but as the weather cools and the glut of offerings slows to a trickle, most of them jump off of the local-sourcing wagon. Not Russet. Mushroom Raviolo with Pickled Cranberries: Though whole-animal cooking is one way to approach sustainable omnivorism, so is choosing entirely plant-based meals, such as Russet’s mushroom raviolo with pickled cranberries and locally foraged hickory nuts. 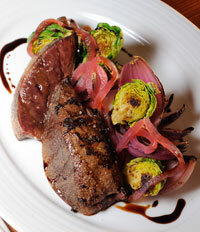 With limited local offerings, winter presents a challenge at Russet. Andrew remembers opening in February and not having “anything,” but now, having celebrated the restaurant’s second anniversary, they’ve established a pantry that keeps their winter menus as dynamic as their summer counterparts. Kristin, who manages the sweet side, and Andrew, who manages the savory, make their own paprika, dry herbs, brew vinegar, can fruit and tomatoes, mill flour, ferment sauerkraut, smoke fish, bacon and speck, and cure salami, prosciutto and scallop bottarga. They even dry their own beans. He can cook this way in part because he has a serious technical foundation in butchery, which he learned from Chef Michael Tusk at Quince restaurant in San Francisco. Instead of buying a case of hanger steaks for convenience, Andrew buys whole animals. The afternoon that Grid spent in the Russet kitchen happened to be the day that Maryland-based St. Brigid’s Farm delivered a whole veal. The restaurant will serve the organ meats first: veal heart tartare, seared liver with smoked and pickled red onion, brussels sprouts and sunchokes, or ricotta ravioli with calf’s brain ragù. St. Brigid, the patron saint for dairymaids and scholars, is an appropriate namesake for the 55-acre farm belonging to Judy Gifford (the dairymaid), and Robert Fry (the scholar ... er, veterinarian). Employing their combined talents, the pair pasture-raise Jersey dairy cows at St. Brigid’s Farm in Kennedyville, Maryland. While their milk currently goes to the Land O’ Lakes cooperative, they also raise their male calves for grass-fed beef and veal (the female ones enter the milking herd). Conscious consumers who feel squeamish about eating veal because of the extreme confinement practices in industrial veal production can rest easy knowing that St. Brigid’s veal is raised thoughtfully.